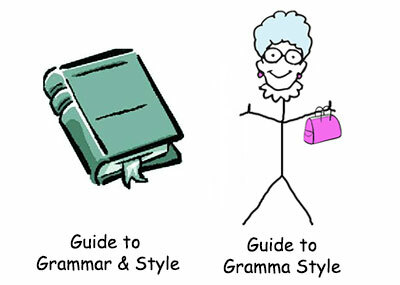 Recently it came to my attention that an issue I’d thought of for years as a grammar error is, in fact, a matter of personal writing style—my personal style, to be specific. In a sentence like this, “The goal of the presentation was to offer guidelines for improving the final product,” to my ear the “for improving” part sounds wrong, and “to improve” sounds right. Wondering about the underlying grammar of this, I proceeded to Google related search terms. I came up empty, so I consulted an expert, who told me this “error” is just a matter of my personal style. I found this rather startling. Not only had I thought of this as an error, but my opinion on the matter had been confirmed by other editors along the way. Apparently, those other editors shared this feature of my writing style: preference for infinitives over gerunds. How do people develop their personal writing styles? Much of it comes from studying writing, whether in school or out. It is also influenced by regional dialect and the way you learned to speak. For example: I lived my first nine years in Pittsburgh, PA. We had moved there for my dad’s work, though, so we did not speak a local dialect at home. Sometimes my sister or I would bring home pieces of Pittsburgh-speak, such as this: “The sink needs cleaning.” My mom would always say, “No, the sink needs to be cleaned.” Is this at the root of my preference for infinitives or at the root of my anti-gerund feelings? I’ll have to consult a linguo-psychotherapist on this one day. Anyway, after my research about gerunds vs. infinitives turned to how personal style can influence writing in general. Here are a couple of common writing rules that are based more on style and opinion than on official English grammar. Sentences must not end with prepositions (e.g., in, on, at, over, under). This used to be a grammar rule, and so many of us had it drilled into our heads. But what about in a sentence like this bit of sarcasm often attributed to Winston Churchill: “This is the kind of nonsense up with which I will not put”? Although there are many cases where a preposition at the end of a sentence should be avoided (e.g, “Where are you going to?” The “to” is just not needed. ), there are sentences where the simplest route to clarity involves a preposition at the end (e.g., “This is the kind of nonsense I will not put up with”). Sentences must not begin with conjunctions (e.g., and, or, but). Again, this was once grammar, and many people were taught it in school. Having taught writing to children as young as second grade, I know children approach the task of writing with great eagerness. And they know they must break their writing into sentences. But they tend to write like the speak. And they use conjunctions all the time in speaking. So, every sentence they write starts with a conjunction! Telling children “no conjunctions at the beginning of a sentence” helps them learn other ways to write, but it also suggests an absolute rule when it's really a matter of style. Personally, I'm all for starting a sentence with a conjunction and ending with a preposition if you don't do it all the time. You could try joining two sentences with a semicolon instead of starting the second sentence with a conjunction, or just make one long sentence. So, where does this leave me with my personal “rule” about infinitives and gerunds? I guess I must admit after my research that using of the "for + gerund" construction is fine, though the infinitive has a more formal ring to my ear. Making decisions about writing style often boils down to formality. If writing for a formal purpose, it is probably best to err on the side of caution and follow the style rules you know most people follow. As far as your own personal style rules are concerned, use your best judgment about what sounds best suited to the situation. Readers: What do you think about gerunds vs. infinitives, ending sentences with prepositions, and beginning sentences with conjunctions? We’re curious: Leave a comment with your thoughts!